JNTUA 2-2 Supply Results Dec 2018: JNTUA B.Tech 2-2 Sem (R15, R13, R09) Supply exam results Dec 2018 declared at jntuaresults.ac.in and jntuaresults.azurewebsites.net. Check jntu anantapur 2-2 r15 results, jntu anantapur ii year ii sem R13, R09 results below. 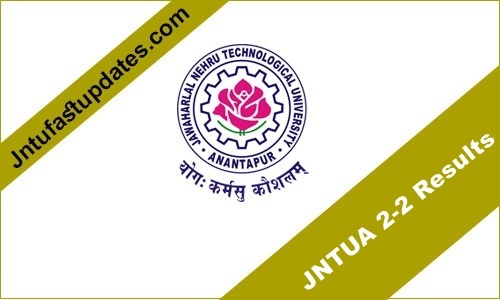 JNTUA 2-2 R15 Results: JNTU Anantapur Conducted Successfully B.Tech 2-2 semester Supplementary Examinations in the month of December 2018. So many students are wrote JNTUA 2-2 exams For R15, R13, R09 Regulations. This Year JNTUA held II year II semester exams in the month of December. Now students are eagerly waiting for “JNTUA 2-2 Results Dec 2018“. The results of following B.Tech Exam 2018 Will be declared Soon at official website. After declared the result, the sheets have been sent to respective college principals. Students concerned are requested to contact their college principals for knowing the results. The results of 2-2 Sem R15, R13, R09 Supply Examinations December 2018 are released. The results will be available in the University Examinations Results portal at http://jntuaresults.azurewebsites.net. Students can check their result from University website. Candidates who are not satisfied with the results and wants to go for revaluation need to do it. The candidates who wish to apply for recounting of theory external marks / challenge valuation / photocopy of answer script should submit the requisitions to their Principals along with the attested statement of marks with necessary fee on or before: 10-04-2019. The fee for photo copy of answer scripts is Rs. 1500/- per subject. How to Check JNTUA 2-2 sem Supply Results 2018 @ jntuaresults.ac.in? Andhra Pradesh has separated the erstwhile JNTU into four different Universities, that are, JNT University Anantapur, JNT University Kakinada, JNT University Hyderabad and JNA & FA University Hyderabad. JNT University Anantapur started functioning from the 155 acre campus of one of its Constituent College at Anantapur since August 2008. As a budding University it is committed to develop and nurture a technical education system in the four districts of Rayalaseema — Anantapur, Chittoor, YSR, Kurnool districts and SPSR Nellore district. 1.2 How to Check JNTUA 2-2 sem Supply Results 2018 @ jntuaresults.ac.in? Sir please tell me results date of r13 first year December 2018. Sir, When will be the 3-2 & 2-2 R15 results announcement. Please let me know !